The Converse Blog: Kirk Hinrich and Alando Tucker give us a preview of the future of Converse. Kirk Hinrich and Alando Tucker give us a preview of the future of Converse. 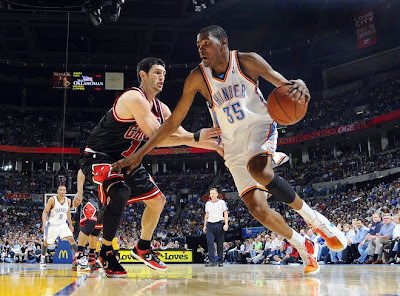 Kirk Hinrich and Alando Tucker have been the two Converse players that have been rocking the most heat this season. Alando's Converse Assists have been some of the better colorways of the team shoe. Although Kyle Korver has been a close second with his Road colorway. 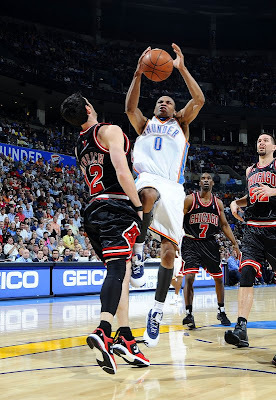 Kirk Hinrich has been wearing the Converse 0100 since he came back from injury. His Black/Red PE of the shoe has been nothing short of amazing. Last night they both broke out one of the new shoes from the Fall line up. These pics are showing up pretty small, so for larger pics check out sports.yahoo.com/nba and search for Hinrich and Tucker in the pictures. First pics, then info. Tucker and Hinrich are wearing the Converse Weapon Evo, a modern, performance basketball shoe evolved from the original Weapon, one of the most iconic on and off-court shoes of all time. The Weapon Evo will launch in energy, inline and team colorways beginning in August. So there you have it, if you were watching close enough during All Star weekend you saw Jameer Nelson wearing a pair while helping Dwight Howard in the Dunk Contest. Thanks for checking out the blog, and have a happy March Madness Day! Hey James I have a question? Can I do a guess spot on your blog? RJ, I think we could probably make that happen. Just email me at Conversencaa@hotmail.com with what you had in mind and we can go from there. Awesome blog, I really hope Converse will do some more updated versions of some classics(I really want another release of the All Star 2000's ), it would really help make 'em more relevant as a performance bball brand again, I can't wait to get a pair of those Hinrichs, and I'm hoping for a Magic Johnson/Lakers colorway of course. funny, i was wondering about kirk's shoes and was going to email you asking. but you had the answer up for a while.